Australian golf will for the first time in history join other national sports in honouring its best professional golfer with the launch by the PGA of Australia of the ‘Greg Norman Medal’. The winner will be determined by a player’s annual success on the Australian and International stage including all Professional tours such as the LPGA, ALPG & Ladies European Tour, and the PGA Tour, the European Tour and other Tours around the world, including those in Australasia. 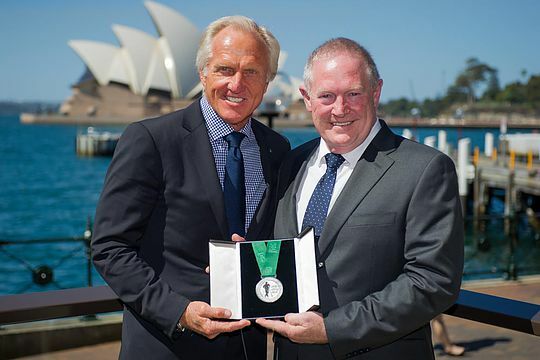 “It’s a great honour to be linked to this award,” said Norman at the launch of the Medal in Sydney this week. The award will be judged by a five-member panel of current or former Professional golfers and chaired by PGA of Australia Vice Chairman Peter O’Malley and supported by PGA of Australia Director and tournament player, Michael Long. PGA of Australia Life Members Ian Baker-Finch and Graham Marsh, along with ALPG member Jane Crafter will complete the panel. PGA of Australia Chief Executive Brian Thorburn said the award would provide Australian golf with an opportunity to celebrate its key player’s success on the world stage. “Whether it’s the Olympic Games, World Cups in Cricket, Soccer, the Rugby codes or Netball; or domestic sports such as the AFL, we recognise the champions who put Australia on that world stage and who excel in their chosen sport,” said Thorburn. The inaugural award for 2015 will be announced at the Greg Norman Medal Dinner, to be held on Tuesday 1st of December, prior to the Australian PGA Championship starting at Royal Pines Resort on the Gold Coast.